Imagine travelling the globe, chasing after bad guys, and saving the world. Wouldn’t that be great? Ever since I was a little kid, I have been fascinated by spies and espionage. It may have been due to all the James Bond movies on TV, but there was another source. One of the byproducts of having two siblings so much older than I, was all the stuff they left behind, from toys to books and comics. Something that caught my attention early on, and likely spurred my love of the cloak-and-dagger of spy shows, was something called “The Man from U*N*C*L*E”. My brother and sister had left behind these things called digests, which were a pulpy, collection of stories. They also had actual drawings as well, and a few glossy pictures all located in the centre. One of the books I read as a child. Later on, I added to the collection by buying my own “Man from U*N*C*L*E” stuff, namely a small comic book of one story, and a large eight-and-a-half by 11 sized book. All of it was based on a TV show that had gone off the air long before I was born, so my entire impression of the show was from what I read, and the few pictures I saw, mostly on the covers of books. 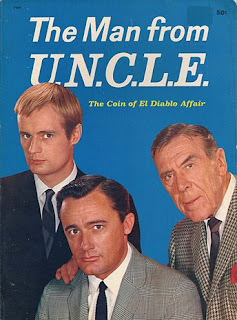 The Man from U*N*C*L*E was actually two men – Napoleon Solo and Ilya Kuryakin (my sister had to teach me how to pronounce “Kuryakin”). They are spies for a supranational organization called the United Network Command for Law Enforcement. Each week they are given an assignment by Alexander Waverly, the head of U*N*C*L*E*, and most often it involved U*N*C*L*E’s rival, the evil organization know as T*H*R*U*S*H. They were outfitted with all sorts of gadgets. The one I recall best and, which was diagrammed in one of the “Man from U*N*C*L*E” digests I read, was Napoleon Solo’s needle gun. And, each story was an “affair”, that is the title ended with that word. I so longed to actually see “The Man from U*N*C*L*E” but, in the 1980s, if one of three TV stations did not air re-runs, it just would never happen. There were no DVD box sets or Netflix, so I was out of luck until one day. Suddenly terrorists stole a nuclear device and demanded a huge ransom – but only one man could deliver it – Napoleon Solo. This was the premise for “The Return of the Man from U*N*C*L*E*: The Fifteen Years Later Affair”, which aired in 1983. Again, I think I discovered it was coming by reading “TV Guide” or maybe from “Entertainment Tonight”. Robert Vaughn returned as Napoleon Solo and David McCallum reprised his role as Ilya Kuryakin. I still recall how they contacted Solo – by using the radio in his pen. “My pen hasn't talked to me in some time,” he said. Waverly is no longer Solo's contact with U*N*C*L*E*, because Leo G. Carroll, the actor who played him, had died. He has been replaced by Patrick MacNee, another tongue-in-cheek spy type actor from his time as John Steed in "The Avengers". Of course, he convinces Solo to take on one last assignment because, after all, the fate of the world was at stake – again. But he needs Ilya Kuryakin. Ilya has left U*N*C*L*E* and become a fashion designer, at a place called “Vanya’s”, after a mission went wrong and a woman died. When Solo shows up, Ilya’s response is predictable. The whole show was exactly as I hoped, a bit tongue in cheek but also action-packed and adventurous. “The Man from U*N*C*L*E” was passing through the ‘80s from another decade, just like “The Beverly Hilbillies”. Both had run their course long before the 1980s even began. I had heard a lot about both but never saw them – until their reunion movies. “The Man from U*N*C*L*E” was exactly what I expected. A few years later, in the summer of 1996, I bought some old episodes of the show on tape, and they proved it. Then, later that same year, YTV started airing the show in its late-night line-up Monday to Friday. Finally, I had the chance to see a show I wanted to see since childhood. Now, I understand Guy Ritchie is planning a re-boot of “The Man from U*N*C*L*E”. I sure hope he can capture the same campy, yet suave and sophisticated feel. You could tell Ian Fleming had his hand in “The Man from U*N*C*L*E”, because Napoleon Solo and Ilya Kuryakin had the same feel as James Bond. It’s something we really don’t seem to have now – a spy show that can have a little fun and not take itself too seriously, give a little wink to the audience but still deliver a solid action adventure story. You'll have to excuse me – I think my pen is ringing. Oh that's awesome to hear. I'll have to check it out. Thanks for that.